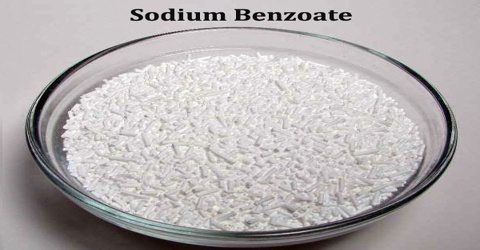 Sodium benzoate is the sodium salt of benzoic acid, which is often used as a preservative and anticorrosive agent in a variety of industries, such food and cleaning. It is an aromatic compound denoted by the chemical formula C7H5NaO2 with a molecular weight of 144.11. In its refined form, sodium benzoate is a white, odorless compound that has a sweet, astringent taste, and is soluble in water. Some synonyms for sodium benzoate are: Benzoic acid, sodium salt; Antimol; Benzoan sodny; Benzoate of soda; Benzoate sodium; Benzoesaeure (na-salz); Natrium benzoicum; and Sobenate. Benzene is a chemical that has been linked to increased risk of leukemia and other blood cancers. While sodium benzonate doesn’t contain benzene, it can form benzene when combined with ascorbic acid. The safe level of benzene for drinking water is only five parts per billion, making the amounts of benzene in some soft drinks a health concern. 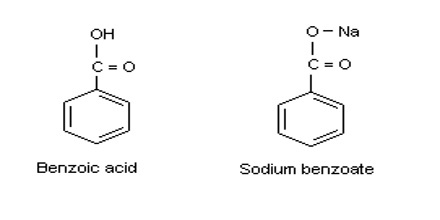 There are three methods for the commercial preparation of sodium benzoate. In one method, naphthalene is oxidized with vanadium pentoxide to give phthalic anhydride. This is decarboxylated to yield benzoic acid. In a second method, toluene is mixed with nitric acid and oxidized to produce benzoic acid. In a third method, benzotrichloride is hydrolyzed and then treated with a mineral acid to give benzoic acid. Benzotrichloride is formed by the reaction of chlorine and toluene. 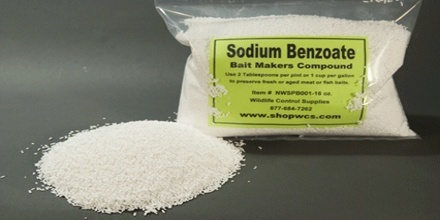 In all cases, the benzoic acid is further refined to produce sodium benzoate. Sodium benzoate is supplied as a white powder or flake. During use it is mixed dry in bulk liquids where it promptly dissolves. Approximately 1.75 oz (50 g) will readily dissolve in 3 fl oz (100 ml) of water. In contrast, benzoic acid has a significantly lower water solubility profile. It is an antimicrobial active against most yeast and bacterial strains. It works by dissociating in the system and producing benzoic acid. Benzoic acid is highly toxic to microbes; however, it is less effective against molds. Overall, it is more effective as the pH of a system is reduced with the optimal functional range between pH 2.5-4.0. The antimicrobial effect is also enhanced by the presence of sodium chloride. The most common source of sodium benzoate is food; manufacturers use it as a preservative to prevent spoilage. 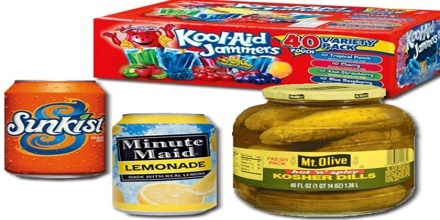 Acidic products like sauerkraut, jellies and jams, hot sauce and soda are the most common sources of sodium benzoate. Less commonly, sodium benzoate is used as a medication to treat hyperammonemia, a rare disorder that causes excess ammonia to accumulate in the blood. Traces of sodium benzoate are present naturally in some foods and seasonings, including cranberries, cinnamon, prunes and apples. It is often used in conventional and even some green cleaning furniture polishes, toilet bowl cleaners, dish washing detergent gels, carpet cleaning products, upholstery cleaners, and dishwasher cleaners. Sodium benzoate is also used in fireworks as a fuel in whistle mix, a powder that emits a whistling noise when compressed into a tube and ignited. Sodium benzoate can trigger allergic reactions in some people, though. According to the December 2007 issue of “Environmental Health Perspectives” it has also been implicated as a potential trigger for hyperactivity in children with attention-deficit hyperactivity disorder. Sodium benzoate does in itself not cause the disorder, and more research is needed to determine what role, if any, it plays in worsening hyperactivity. Reference: thespruce.com, livestrong.com, encyclopedia.com, wikipedia.